Caution: another sad write and release posting… This blog is my designated place where I release my thoughts. When someone is able to relate to something I write, I feel less alone. But I never lose sight of the fact that it’s my own personal loss and journey. Nine months later and the pain has definitely changed from unbelievable sadness to intense deep suffering as the reality sinks in more and more each day. If anyone would have told me that I could feel worse than I did months ago, I would not have believed them. But I do. As I was driving home from work last night I had an aha moment when I realized that nothing that happened before August 4, 2013 matters now. Reality is that my life has been defined by the death of my youngest daughter. Prior to that sucker punch, everything else was just rather ordinary. Some people may wonder how I will manage this Mother’s Day without one of my children and probably appreciate their children a bit more this year. But dammit, I don’t want to be the victim so others can learn a lesson. My family has been forever changed. Someone we cherish and love will always be missing. We are being forced to live without someone who completed our family. There is just no easy way to do that. For anyone who has not walked in my shoes and has a strong opinion on when it’s time to get over it, first thank God and the universe that it didn’t happen to you and then man up and just admit you don’t know what we are going through. Counting my blessings will never reset me. Noticing others who are courageous despite their challenges does not motivate me into snapping out of mourning the loss of my daughter. That may not be a truth I should be sharing. When people throw the count your blessings or well, at least … at me, it just confirms that the pain that I co-exist with is one they have never experienced. I have met enough knowing people in the past 9 months who have confirmed my worst fears. You never get over this. Maybe it affects you a bit differently depending where you are in the life cycle. I would never presume to speak on behalf of any other grieving parent but myself. I am in my late 50s and Amy was my youngest. The joy of retirement and anticipation of my golden years has lost it’s luster as my husband and I carry this deep sorrow in our hearts. Amy was supposed to be part of the picture we painted in our minds along with our other children and maybe possible grandchildren. When I was a young girl, our next door neighbor, who was a young child at the time, died from complications of pneumonia. I remember feeling sad but we moved away and I forgot about him –until now. We were also friends with a family who later lost 3 of their children. Sad story; I cried. But now I wonder how that mother managed. The first child was tragically hit by a car when I was a teenager. He was her youngest of 6 children. In recent years, I learned she lost two of her daughters. I cried upon learning that tragic news, but now I am overwhelmed with compassion. And little did I know that some day it would be more than someone’s sad story. I learned the Mom passed away, but did live a long life. We do not live in a society which prepares us to lose a child and it is definitely not one which is conducive to healing. Sadly, I feel like a freak or a misfit in this society. My husband said no matter where he is, he feels out of place. It takes all of my energy to go to work and be part of their normal world. Once I get through the work day, my grief just overwhelms me. My natural inclination is to hide and retreat. A few women I know periodically send me an email inquiring how I am doing. One of them said she is too busy to read my blog, and I find it unbelievable that she would expect me to rehash my pain in a private email to keep her up to date. One big whatever to that. Some of the flashbacks are returning too — my son shared the same thing is happening to him. Can’t blame that on Mother’s Day. Below is a poem that you may or may not be able to read from your device, but I can read from my iPad by clicking on it to enlarge it. It was written for me by Amy. I took a picture of it with my cell phone because I couldn’t bring myself to retype it. I believe she was 14 when she wrote this for me. A treasured gift. Could not have said any of it better myself. Always in my prayers. Thank you so much! I am so sorry for your loss. Yes to everything you said. All so very true. That poem is so wonderful and heartbreaking now that Amy is gone. Wishing you a few moments of peace on Mother’s Day. 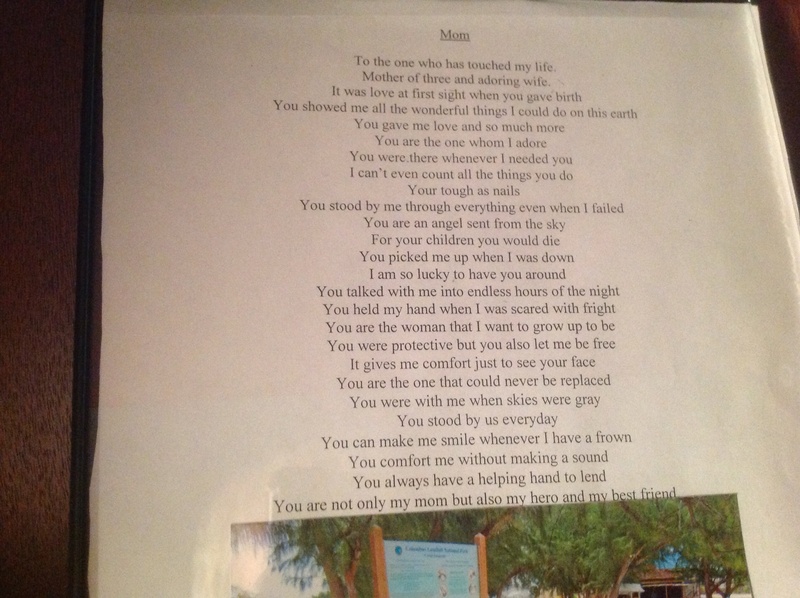 Thank you for reading my post as well as my sweet Amy’s poem. I am so grateful for the support and so sorry for your loss. Thank you so much for reading and responding to my post. Hugs to you too and thank you also for the support.